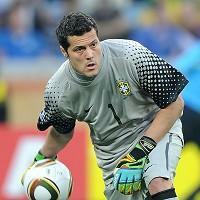 Brazil goalkeeper Julio Cesar believes his team is ready for the next chapter of the World Cup after taking a point from their game against Portugal and finishing Group G unbeaten. After wins against North Korea and the Ivory Coast, the Canarinha were held to a goalless draw by Carlos Queiroz's side, a result that assured Brazil finished top of the pool - two points clear of the Portuguese. Brazil will now face Chile and Julio Cesar believes it will be a difficult test as he said: "Now a new and more complicated stage in the competition begins and I am certain that Brazil will be ready."